A quick detour to Ghent was factored into our Brussels to Bruges drive. Not too far out of our way, I expected a cute little town where we could spend an hour or so before carrying on. What I didn’t expect was how utterly gorgeous Ghent would be. So blown away by this city, we all agreed it ranked as one of our Belgium favourites. Signs for a Park and Ride were clear and easy, the car was soon sorted but locating the tram proved a wee bit harder. The biggest challenge though was yet to come – buying the tram tickets from a machine we had no clue how to operate. We worked out tickets could not be bought on board, the machines gave no change and our short tram ride cost well over the odds. Frazzled and stressed were apt adjectives for the start of this journey. The mood improved when we clambered out at what we looked like the right stop and started to take in the city. Less renowned than Bruges it has so much to offer, not least a splendid array of beautifully preserved medieval buildings which dominate the centre. Breath-taking from first glance. There are stacks of museums and galleries, however for us it was all about the architecture. Elegant and imposing every building is a beauty. Another bonus this is the largest car-free area in Belgium which makes strolling such a pleasure. Strolling was just what we did, losing ourselves in narrow streets leading to endless fascinating squares with endless beautiful churches. At Limburgsstraat we got a great glimpse of the three towers of St Nicholas Church, the Belfort and St Bavo’s Cathedral. 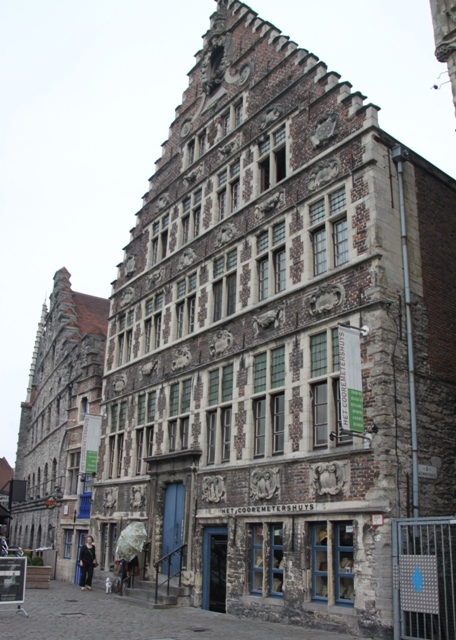 Ghent’s wealth in the early medieval period was thanks to the import and export of wheat and the manufacture of luxury woollen cloth. The great and good were not shy about parading their riches, the Catholic Church was often the happy recipient. We found St Michael’s Bridge and took many pictures of that breath-taking medieval skyline, the old harbour of Gras and Korenlei- all stunning. Our day finished with a stroll along the Graselei. The medieval port of Graselei was the best spot to feel the Ghent vibe. The guildhouses, all impressive reminders of the city’s economic growth are superb add to that a host of welcoming bars and cafes along the waterside – just what we were looking for. Sipping a beer in the late afternoon sunshine, people watching and soaking up the atmosphere of glorious Ghent – just perfect. I was on the fence about whether a day in Ghent would be well spent, and now I’m regretting not going! Looks like some beautiful architecture and interesting history! This was the first time I’d been there – despite studying in Belgium for a year and visiting numerous other times. Don’t know why now – it is just stunning. We only got a flavour of the place – just a few hours wandering around but I would most definitely go back. This has been on my ‘to do’ list for some time. I hate those ticket machines that are impossible to understand. I had a problem at an airport in Poland, missed the bus and had to resort to a taxi. It’s stunning – not really touristy too and a lovely atmosphere. If you can work the ticket machines and sort that out then all is well!! Our tram ride was probably one of the most expensive things on this trip. That’s a gem you discovered! So beautiful. That makes me want to visit Brussels! Thank you for sharing your impressions! It is a real gem Erika – not too busy, not too touristy but so gorgeous, we just loved it. Yes, it feels like as you say when watching the pictures. It looks quiet and like being sent into an different time. I never made it to Ghent despite it being high on my To Do list. We were always traveling at the wrong time of year for Western Europe. Your photos make me want to get there and explore it for myself even more. It was a warm (but overcast) summer day Laura so that made it good for strolling. It is a stunning place, the buildings are just beautiful and apparently it survived the war intact so they are originals. If you’re ever in Belgium again I definitely recommend a stop in Ghent. Also, I love the architecture you shared. I wonder if they have a walking tour there showing off the most famous buildings. That would be fascinating! No idea whatsoever about those shoes – curious to know what they meant too – but I couldn’t resist that picture. A walking tour would be fantastic – we just had a couple of hours there as a stopover but when (hopefully) we go back that’s the first thing I would sign up for Jenny. What a beautiful city! 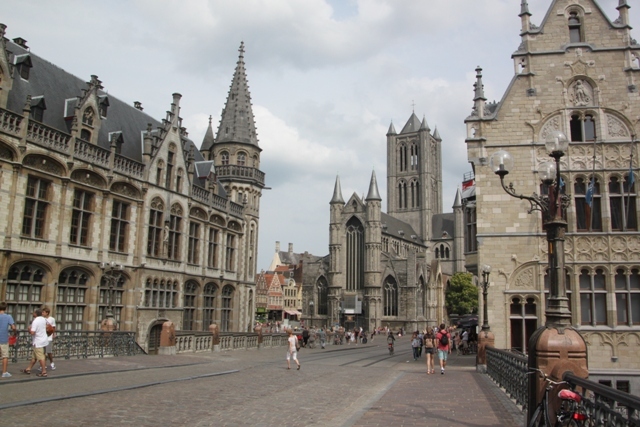 We missed Bruges when we were in Belgium and now we must add Ghent to the list as well. This was a bit of an after-thought for us but so glad we went there. It is just beautiful, not too busy or touristy but such a wonderful atmosphere as well. I would definitely put it on the list!! Gorgeous photos. I’ve been to Bruges, but never Ghent. Next time! This was a first time for us too – it is a really stunning little place. 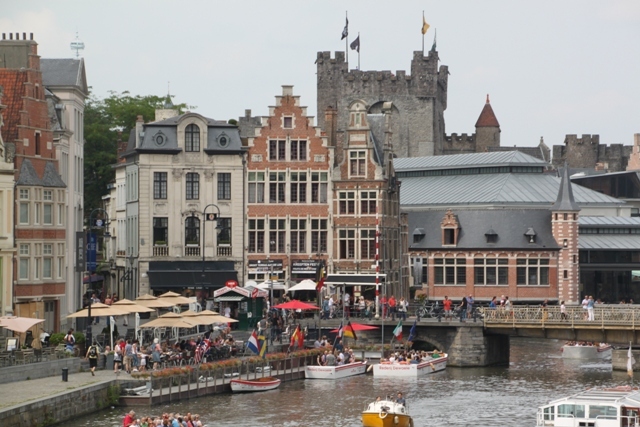 Just perfect for strolling with an ice-cream in hand – a bit like Bruges but much less busy and a bit quirky. We loved it Kimberly. I know Suzanne you can’t do everything, we had been to Belgium before but never made it to Ghent. After this trip I’m quite sure we’ll be back and spend longer in this lovely city. It does look quite a lot like Bruges but with far less tourists and a very relaxed and chilled atmosphere Rosemary. It was an after-thought for us, I hadn’t done my research hence the tram fiasco but it all worked out in the end!! 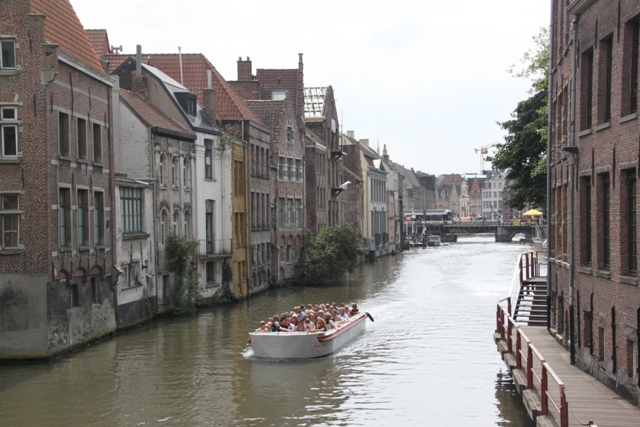 Still Ghent turned out to be the most lovely surprise – we would definitely go back. The sunshine has been wonderful – we’re making the most of it while it lasts!! 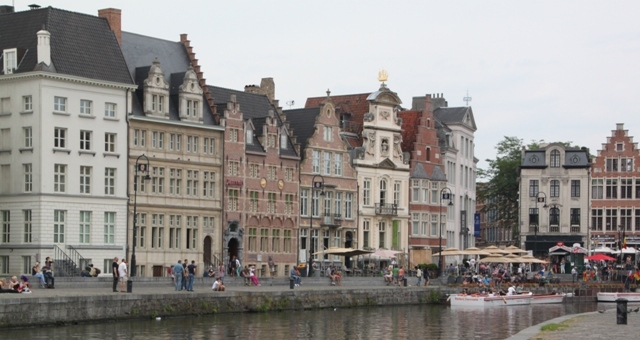 Belgian cities like Bruges and Ghent… steeped in rustic antiquity. You capture the untouched city so well in these pictures! Thank you Andrew – it is not hard to take good pictures in such a photogenic city – Ghent is so pretty and those incredible buildings are like a fairytale, we just loved it. Thanks for the great pics. Couldn’t fit in getting to Ghent AND Brugge so had to make a choice. You showed us what we missed. Looks wonderful. 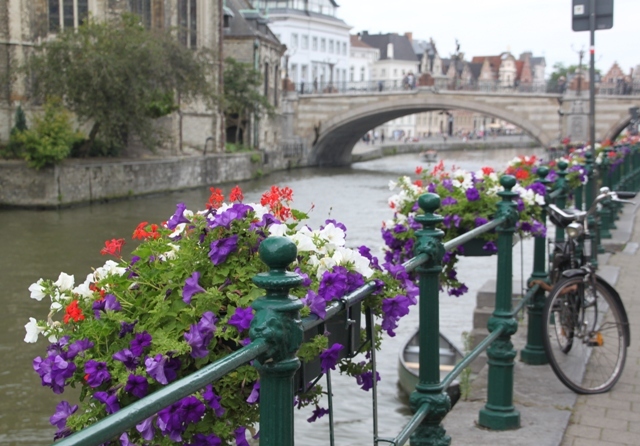 We were lucky enough to have time for both – I think they are quite similar in terms of architecture, Bruges was a lot busier with much more going on, but we did love the quiet charms of Ghent. Maybe next time for you…. My Belgian favourite as well, just love the feel of it! May have something to do with two of my best friends from my exchange year in Germany living there (well, nowadays close by) and us always having a great time when meeting. 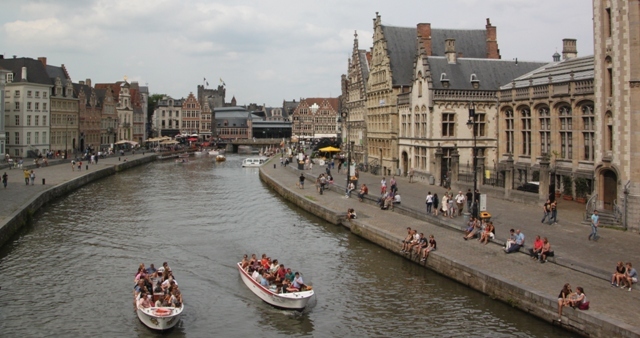 That must be great – having resident Ghent tour guides – always the best way to see around a city. We just loved the atmosphere and vibe not to mention the bars by the water!! 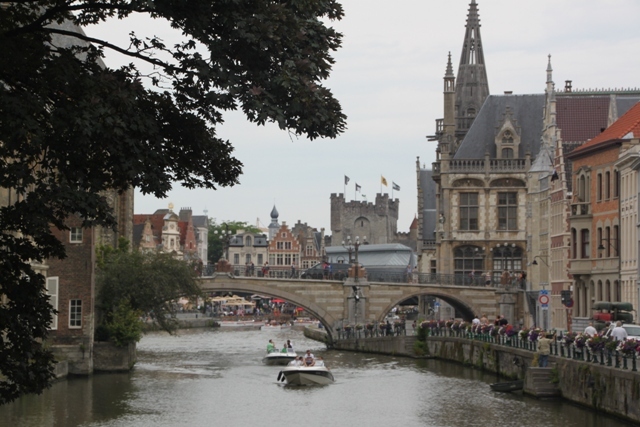 We had a week in Bruges last year and took a day trip to Ghent – the train made for a much less stressful journey! I agree it’s beautiful, though I preferred the more intimate feel of Bruges. We spent a week in Bruges after this and loved it there too, it was so packed though especially during the day you could barely walk along the streets. Ghent was really peaceful but still enough people around for a good atmosphere, think that was why we loved it so much. Also not planning to visit, not expecting much I think we were also surprised to find how lovely it was. Ah, Bruges was not so crowded when we went (March/April). We were there in August – peak summer holiday time – we did enjoy it but think March/April would probably have been better. Also we went at the beginning of August to tie in with the WW1 events, it was probably even more crowded than normal!! We were astonishingly lucky with the weather too (this was last year) which made wandering around even more enjoyable. I quite like Ghent, I went there last year and we had gorgeous weather 🙂 The architecture is fabulous. and in the evening, everything is well it up. Unfortunately we were only there for a couple of hours in the afternoon before we headed to Bruges. The weather was lovely on our visit – hot but not too sunny which was good for strolling. We didn’t see it lit up unfortunately – maybe next time!! It was lovely – beautiful buildings and lovely streets to wander and just lose yourself. We loved it, a bit like Bruges but quieter and more relaxed I thought. Definitely recommend a trip there. 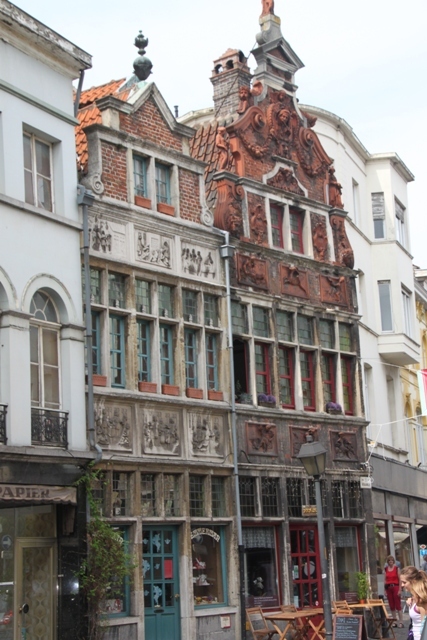 Great Ghent posts – I’d read the chocolate one but somehow missed the others!! Wish I’d read them before our trip. We loved it but didn’t have enough time really, just a couple of hours so we strolled and soaked up the atmosphere. Didn’t go into the churches either so missed the altar piece. I would love to go back though and that would be top of my list! yeah its a small town but still needs at least a few days to explore. There was also a sunday market across St bavo cathedral when I was there, it was nice. Hope you have another chance to visit and stay for a few days. Glorious describes Ghent well. What a beautiful city! I wonder if it sustained much damage during both world wars. Hope not! It survived both wars virtually intact and undamaged, so even better to see this gorgeous buildings Ana and know they are original! Love the riverside photo with the flowers and the bicycle 🙂 It’s the little pleasant surprises that make for a great trip, isn’t it? Absolutely true Melissa, I went here not expecting much and was blown away – it was a great surprise! We haven’t made it to anywhere in Belgium … yet! … and I’m confident we will love it. Thanks for encouraging a trip to Ghent. We really loved this surprising little place – so glad we detoured!! Belgium was a superb holiday for us – sure you would love it too!! … Where is home for your family? So Belgium is very close. Good for you for taking advantage of its closeness. Wow…I don’t know of any other word that would do those photos justice. Great post and food was not even in the conversation..:) go figure. That’s true George – although the lunch and beers we had there were totally wonderful!! We loved Ghent – it was a complete surprise to us – and a good one!! Have a great weekend. There is so much action and character in your photos. Very nice! Thank you so much – but it would be hard to take a bad picture in this place, it is so photogenic and picturesque!! Have a great weekend. It is so nice to be surprised by little pearls like this one! When you expect nice, but then you are just unexpectedly blown away. Lovely photos! The house with the blue dor and blue windows, squeezed in-between the larger ones, so charming! I can definitely see why you liked this town! I loved that house too – just gorgeous, but then most of the buildings, especially down all the little alleys were too – quirky and unusual, it is such a great place. What a beautiful city! I was in Bruges not that long ago, but I had no idea Ghent is so nice. I should put it on my to do list 🙂 I’m happy you had a great time there. Have a lovely weekend! We had no idea either Lucy so it was such a great surprise. A wonderful city to explore and stroll around, we just loved it – you should definitely try and make it there if you go to Belgium again! Hope your weekend is a good one too. Ghent looks amazing. The second book in Helen Grant’s Forbidden Spaces trilogy (Silent Saturday, Demons of Ghent, Urban Legends) is set in the town and makes dramatic use of the churches, cathedral, the castle and the rooftops. Haven’t read these books, just googled them and promptly ordered the trilogy!! Thanks for the tip Margarita – think we’ll all enjoy reading them and love the idea they’re set in Brussels and Ghent. I absolutely adore Ghent! I was there last summer for my 30th birthday & just fell in love. I try to tell everyone about it because, as you said, it’s not as well known as Bruges but I think it has a lot to offer! Glad you enjoyed it there Stephanie as much as we did – sounds like you had a great birthday!! It was a real surprise for us – I would just love to go back and explore more. Yay, my hometown! Often overlooked, but a true gem! Totally agree Eva – a real gem, what a lovely place to call home – you’re very lucky!! It’s a hidden gem, I think most people don’t go there visiting Bruges and Brussels instead, we have always done that in the past. After loving this unexpected detour so much I have a feeling we’ll be back in Ghent! gorgeous photos! Looks like you had fun. It is a really gorgeous city – easy to take great photos. We loved it – a great vibe and so much to see. Thanks Angela, it’s such a lovely city, a perfect picture round every corner!! I’m so happy you liked Ghent! Sorry to read about the tram tickets! Didn’t anyone help you out? You’ve seen quite a lot really! 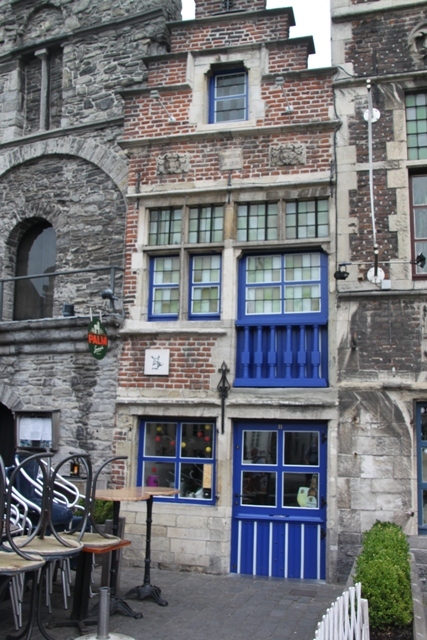 Like the smallest house of Ghent, the oldest candy shop of Ghent…. Just Great! We absolutely loved it!! The team tickets were only a small thing really, we just got a bit stressed but there was no-one around to ask, otherwise I’m sure help would have been readily available!! Everyone we met was so friendly – we just couldn’t find anyone at the team stop!! Fascinating looking city… interesting architectural styles. Beautiful pics- you’ve added yet another place to my list, thanks for sharing! It is gorgeous – we loved it and would really recommend it. Hi Joy, I’ve been away so I’m busy catching up on my favourite blogs (and my own!). 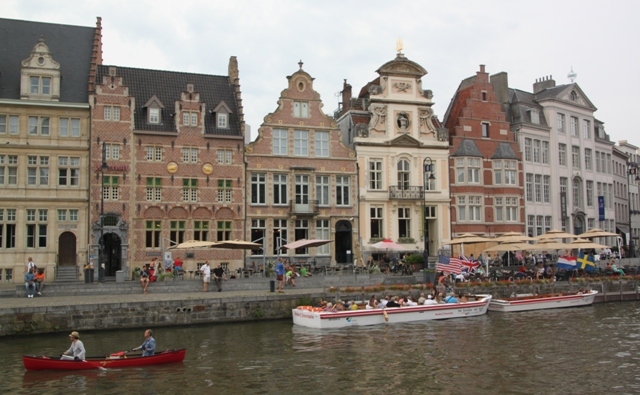 Stunning photos – I never knew Ghent was so lovely – thank you! Thanks Susan – I’ve been away too and still to catch up – so many blogs to read!! Ghent is just gorgeous, we didn’t realise what a lovely side trip this would be. A place I would definitely return to and explore far more!! Hope you had a good time away. We too aimed to see Beige but fell in love with Gent. It’s such a gorgeous city – the buildings and streets are stunning, we just fell in love with it. Thankyou for “liking” my Blog. You have taken me on a delightful outing to Ghent today – this is a place that I have not seen but am now very tempted. Thank you for coming by here too!! Ghent is a gorgeous place, we loved our short trip there and would be tempted back again for sure as well!! It’s such a lovely city – we had a great time just wandering and soaking up the atmosphere. I would love to go again too!! Did you eat the candy special to Gent ? No, didn’t know about it – was it good? It was a bit of a grey day but still very hot, this actually suited me better Jo, easy to stroll without blazing sunshine, I’m not good with that!! It was a lovely surprise, I didn’t realise just how beautiful it was. It was not busy at all on our visit, empty streets and it was almost like we had the whole place to ourselves. Sounds completely different to your time there Mark – however it must have been a great atmosphere, think I would have loved to experience that too!! What a wonderful town You presented. I really enjoyed every photo. 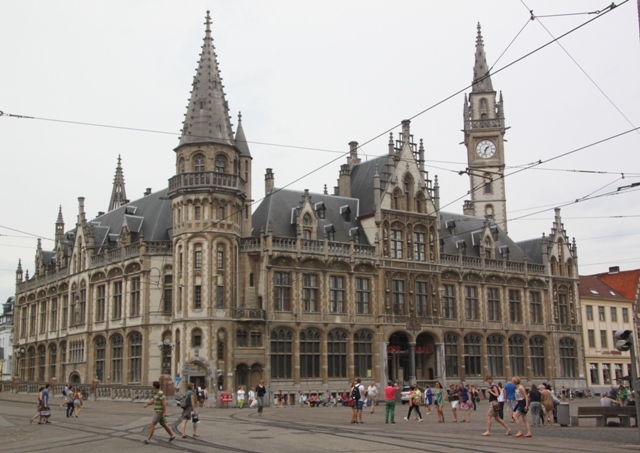 I have been only in Brussels, so I have to add Ghent to my list. 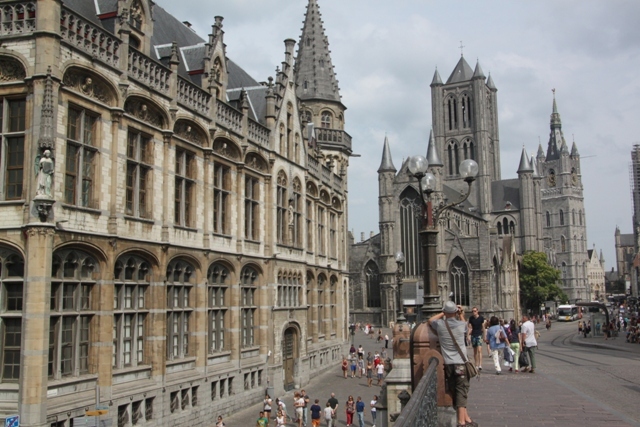 Definitely recommend Ghent – we had such a great day there. I visited Ghent for a few days because it was in a good location to rest on my bike tour through Europe. I remember it as the hidden gem. And your photos prove me right!!! Amazing! A perfect mix of old castle-like beauty and a real functional city not dependent on tourism. Great pics! We completely fell in love with Ghent. It was also wholly unexpected, everybody goes to Bruges (loved it there too) but not many people mention Ghent. We just stopped off to break our journey but were absolutely blown away. It is just gorgeous. 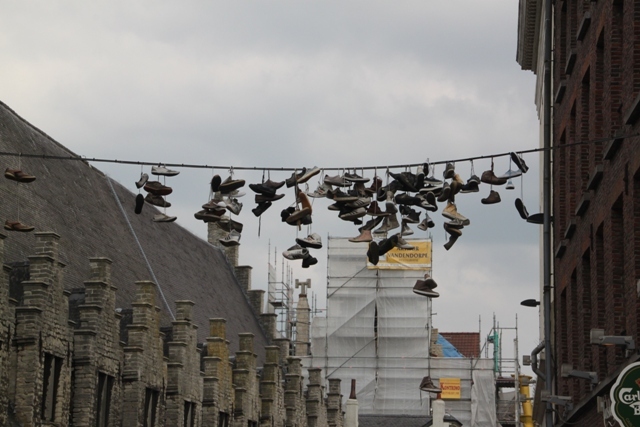 Thank you for your lovely post about Ghent, and for the photos. We passed through there in 2013 and were also very taken by it. You did it much more justice in your blog, though. Thank you!! We loved Ghent, a last minute decision to stop there but now so glad we did, it is just lovely. We loved Brussels too!! Ghent was such a lovely surprise though, such a beautiful place and so much fun to just wander and take in the atmosphere. I guess we’re all guilty of taking for granted the places that are local to us – I know I am! !